ID123 is a digital ID card mobile application for schools, businesses and membership organizations. We showcased a number of new innovative features for the mobile ID card app at the Future of Education Technology Conference. 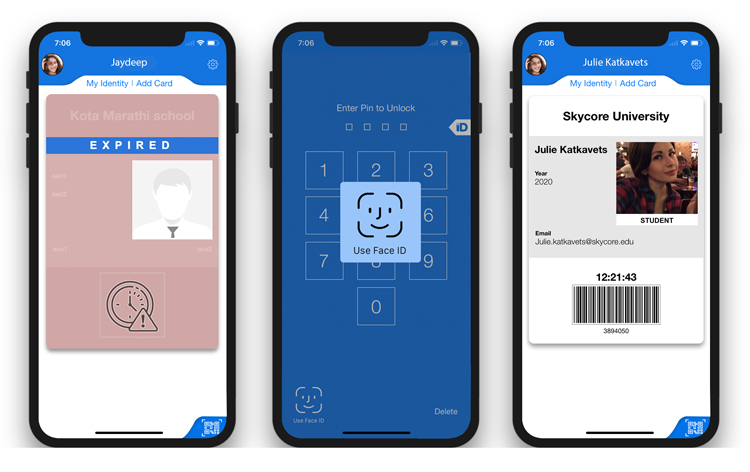 These features include “Face ID” unlock for iOS10, the automatic expiring of cards based on the expiration date or duration, and support for Code39 barcodes. Our company continues to innovate and provide our customers with new features which will enhance our service security and compatibility. iPhone X users can now unlock their ID app using facial recognition technology. Apple released iPhone X which enabled users to unlock their phone with Face ID. We wanted to make it easy for institutions to use the most advanced security features available. The ID123 app will therefore support fingerprint on Apple devices with Touch ID and will support Face ID on the iPhone X. Many institutions are concerned that their members, students or employees can use their ID cards after they are no longer affiliated with them. Our team solved this issue by developing a way for administrators to set expiration dates to all issued cards. As a result, if an ID card has an expiration date, it will automatically be revoked after they expire. We have added support for Code39 barcodes in addition to QR Code, Aztec, PDF417, and Code128 which were already supported. Some educational institutions have barcode scanners that can only scan Code39 barcodes which can result in compatibility issues. Therefore, these institutions can now select the barcode format for the ID123 app that works best for them in our ID management system.